* Not applicable to ICANN fees, taxes, shipping and handling, sale priced domain names, bulk domains, premium domains, Sunrise/Landrush domain registrations and pre-registrations, memberships or maintenance plans, additional disk space and bandwidth renewals, additional AdSpace advertising funds, custom page layouts, incorporation and brand identity services, Go Daddy Marketplace® products, posters, die-cast cars or gift cards. 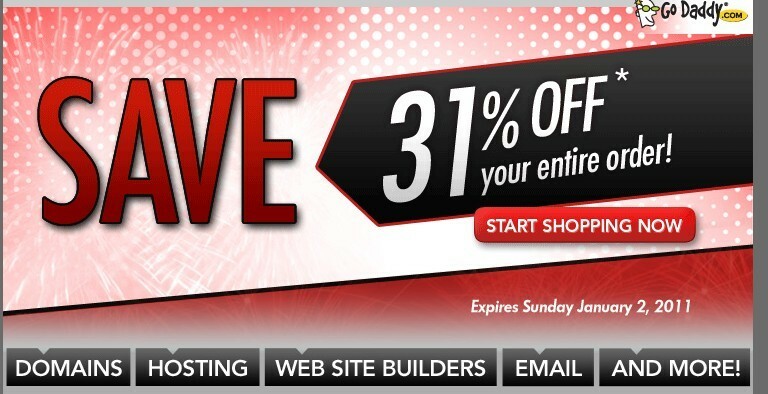 Discount reflected in your shopping cart - cannot be used in conjunction with any other offer, discount or promotion. Offer expires Sunday, January 2, 2011 at midnight (Mountain Time). † Plus ICANN fee of 18 cents per domain name year.